Hanover - The finish line is in sight for relegation battlers Hannover and VfB Stuttgart and, while Matchday 32’s curtain-raiser (kick-off 18:30 GMT/20:30 CET) doesn’t quite fall under the six-pointer category, it nonetheless promises to be a fierce encounter in the battle for survival. Both teams will be confident stepping out under the Friday night floodlights. The 96ers grabbed a second straight win against Eintracht Frankfurt last weekend, while die Schwaben moved four points clear of the drop zone courtesy of a 3-1 victory over FC Schalke 04. 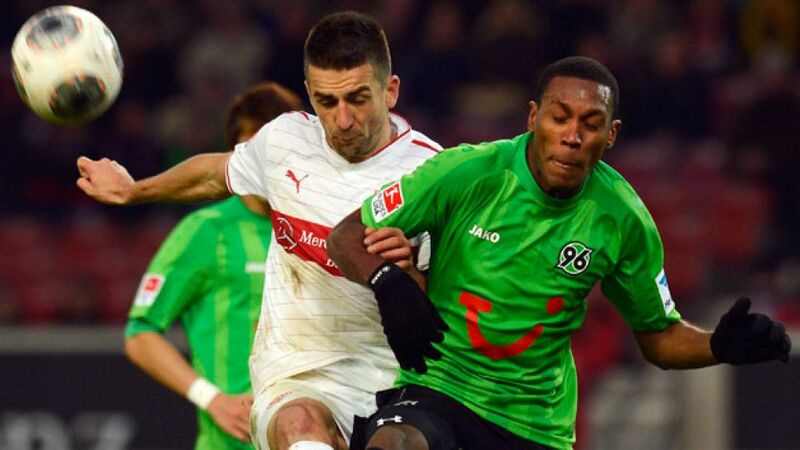 A win for Hannover and they can categorically start planning for next season in the top-flight, while victory for VfB will leave them on the brink or survival. A dip in form in March had the Hannover faithful looking nervously over their shoulder, but fast forward two weeks and an injection of passion and determination has seen Tayfun Korkut’s side engineer themselves a comfortable cushion, and they now sit in the relative safety of 14th place. However, though the Reds have their fate in their own hands - victory will open up an 11-point lead over 1th-placed Hamburger SV with just three games remaining - the Turkish-born head coach is not about to let his players put their feet up just yet. However, Korkut will have to make do without several first-team regulars, with Leonardo Bittencourt and Edgar Prib, both suspended, joining long-term absentees Felipe and Mame Diouf on the sidelines. The 40-year-old admitted that “VfB have an excellent squad of players who possess exceptional quality”, and may be tempted to make use of a two-man frontline, with Artjoms Rudnevs waiting in the wings to lead the line alongside Didier Ya Konan, who has two goals in his last two games. Stuttgart, meanwhile, are having to cope with a lengthy injury list of their own. Rani Khedira is unlikely to make his return from a torn muscle, while questions marks remain over the fitness of Daniel Schwaab, Arthur Boka and Carlos Gruezo. “We’ll have to see how they come through the final training session,” explained coach Huub Stevens in his pre-match press conference. VfB were the big winners on Matchday 31, as not only did they make it three games unbeaten after victory over the Royal Blues, but also saw all three teams below them suffer defeat. One player in particularly good form is Martin Harnik, whose scored six goals in his last eight games, but the Austrian international believes "there are more important things to think about. The win in Schalke was just a small step. It's a nice cushion, but one that can be taken away very quickly though." Stevens’ men are now four points ahead of HSV, who occupy the relegation play-off spot. Victory in the HDI-Arena would not only take them a huge step closer to safety themselves; it would also heap far more pressure on Hamburg, who will themselves be unable to catch VfB if they are beaten by FC Augsburg on Sunday. The incentive for Stevens and his team, then, could not be much higher.